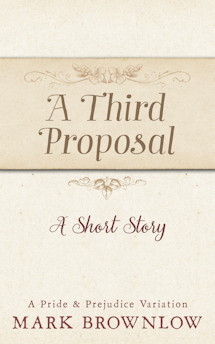 Join Mr Bennet as he plays an unwitting Cupid to a young Regency pair in the novel Cake and Courtship and stars in a new short story: A Third Proposal. Or join Charlotte Collins as she tackles the troubles of the Hunsford villagers in the novellas The Lovesick Maid and The Darcy Ring. Explore the inboxes of Jane Austen's characters and figures of the past, or read a few random musings. Sign up for the email newsletter! Sometimes all it takes is a few pages to tell a story. And so it is with A Third Proposal, a vignette from the life of Mr Bennet as he returns to Meryton from a trip to London. All is not well at Longbourn and Netherfield. But who’s to blame? And can Mr Bennet save the day with his wit and wisdom? This quick winter’s tale stars our beloved head of the Bennet family, his daughter, Elizabeth, and his prospective son-in-law, Mr Darcy. There’s a cameo from another Austen character, too, inspired by a suggestion from one of my readers. But I won’t spoil the surprise. This is my first foray into the short story format with a (dare I say) rom-com approach. In the meantime, work is underway on the second book of Mr Bennet’s Memoirs. As a writer, it’s like meeting an old friend again and falling back into conversation as if the intervening months were but a day. Oh, and a little belated, but it needs saying: happy 2019!